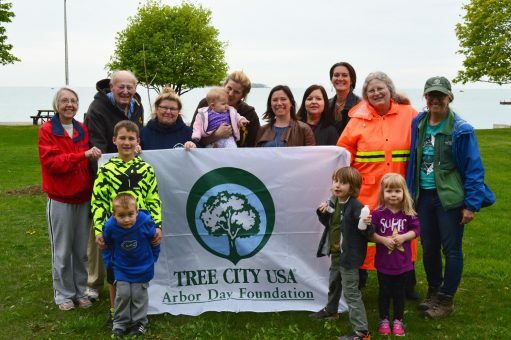 Once again, Put-in-Bay, Ohio, has been named a Tree City USA by the Arbor Day Foundation in honor of its commitment to the goals and principles of the Arbor Day Foundation. Put-in-Bay achieved Tree City USA recognition by meeting the program’s four requirements: a tree board, a tree-care ordinance, an annual community forestry budget, and an Arbor Day observance and proclamation. Put-in-Bay‘s Arbor Day Celebration will take place on Friday, April 26, 2019 at 4:00pm. The Council of the Village of Put-in-Bay has allocated funds for Arbor Day expenses. On Arbor Day, a hoptree (wafer ash) and a Shadbush (Juneberry)will be planted at the village Arbor Day site adjacent to between the Put-in-Bay Post Office and the village housing. Both trees are native to the islands and can be found on the cliffs here. The hoptree is a host plant for the caterpillar of the giant swallowtail and is a member of the citrus family. Shadbush gets its name from small white blossoms in the spring, about the time shad (a fish) spawn. The Arbor Day Foundation is a million member nonprofit conservation and education organization whose mission is to inspire people to plant, nurture, and celebrate trees. Information is available at arborday.org. Members of the Village of Put-in-Bay Tree Commission are Lisa Brohl, Kelly Faris, and Kendra Koehler.